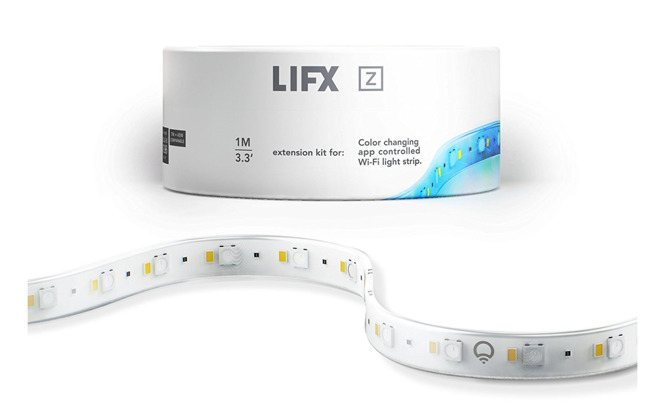 The LIFX Z strip connects directly to wi-fi, with the new version not needing a bridge for connectivity. A new controller is available for older strips, adding support for HomeKit. From launch, the LIFX strip-lighting system has allowed for app-controlled color changing for up to 16 million colors. The software allows a single system to be divided into multiple zones, with different effects and colors configurable in each segment. A LIFX Z Starter Kit contains two 3.3-foot strips and a power pack. Kits designed for the U.S. market are available now, with international power supplies available in late November. The system also has compatibility with Google Home, and Amazon Alexa. HomeKit compatibility has come at a slight cost. The new LIFX Z Starter Kit with HomeKit compatibility is now $89.99. The bridge allowing for HomeKit compatibility with older strips is available for $39.99 without a power supply, and $49.99 with power. Additional 3.3-foot extensions are available for $29.99 for 3.3 feet, and $99.96 for four 3.3-foot strips. LIFX had previously announced HomeKit compatibility for most of its smart lightbulbs in September. At about the same time, the company debuted it's Tile Kit and Beam lighting systems, that are also Homekit-compatible.